Aromatic bitters have a long history of medicinal uses; now the tonics are seeing a resurgence in modern bartending practices. While the craft of mixing cocktails is celebrated as a complex and careful art, it doesn't always have to be a complicated undertaking. This is partly the philosophy behind a Spokane couple's growing business producing small-batch aromatic bitters that can offer a flavorful complement to both alcohols served neat, or as multi-ingredient libations of any scale. 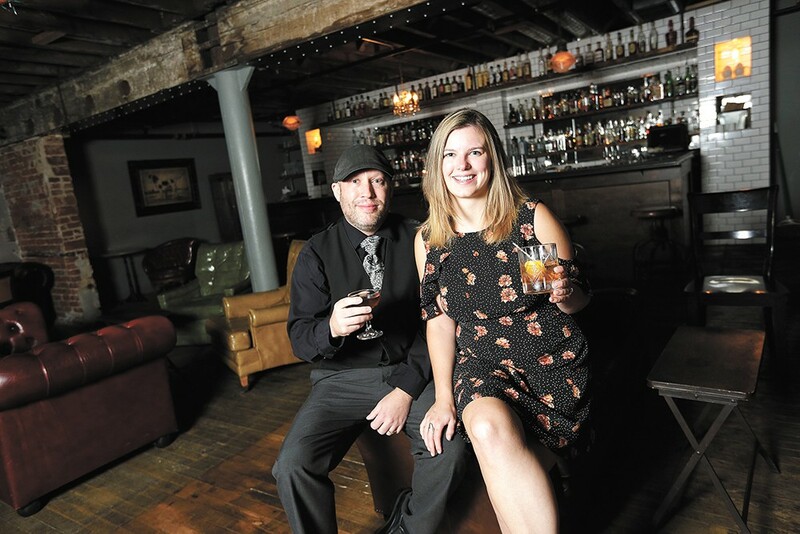 Shelayna and Tyson Skidmore — who've each worked more than a decade in the hospitality industry — have seen Skidmore Alchemy, their line of aromatic bitters, significantly expand in use at bars across the region since early this year. Nearly two dozen local bars and restaurants now carry the couple's cocktail additives, which can be used to splash a hint of herbal or fruit-based flavors, among others, to all variety of alcoholic beverages. "Bitters is the salt and pepper of the spirits world," says Tyson. "They're not there to change the flavor of the product, but to enhance it and make it better." Skidmore Alchemy currently offers 12 flavors: peach, orange, honey ginger, basil lavender, cherry, grapefruit, chocolate, curry, rhubarb, blueberry mint and huckleberry jalapeño. The line also includes an aromatic whiskey bitters, which the couple say is more cohesive to use in a classic Old Fashioned cocktail than the traditionally used Angostura bitters, which is rum-based. Instead, the Skidmores use whiskey as the bitters' base spirit, then infuse it with cinnamon, clove, allspice and other herbs and spices. The whiskey bitters can be used in place of Angostura, if desired, or in any other way a bartender or home mixologist sees fit. "The craft cocktail movement is so big right now, and people are seeing how expensive it is in the bars, and they also are wanting to make these drinks at home," explains Shelayna of their inspiration to found the business, which the couple currently manage in addition to their full-time jobs; she's on the waitstaff of the Manito Country Club, and her husband is assistant manager of Poole's Public House on the upper South Hill. The pair met while both working at the now-defunct MarQuee Lounge in downtown Spokane. "What we're hoping to achieve is that people can use the bitters at their home bars," she continues. "That's where the cherry and orange bitters come in — you don't need fruits, you can just make an Old Fashioned with whiskey, sugar and orange and cherry aromatics." Tyson and Shelayna Skidmore's bitters are designed to enhance any cocktail or spirit. Alcoholic bitters, also called aromatic bitters, have a history stretching back to the ancient Egyptians. The earliest uses of bitters, and for centuries thereafter, were mainly for medicinal and digestive applications. In modern bartending practices — and originally in the pre-Prohibition era — the highly concentrated alcoholic flavorings are used to add a sweet, sour, bitter or spicy note to spirits or cocktails. In most instances, as with the Skidmore Alchemy line, only a few drops of bitters — taste one drop on your tongue and see where the name comes from, and why the tonics aren't meant to be consumed alone — are needed to add the desired flavors to a standard beverage serving. Sold in 3.5-ounce bottles ($12-$13 each), the couple estimates that customers can make 100 or more cocktails per bottle. "As far as uses go, it could be as simple as you want a martini and you want it up, and without any crazy mixers, but you want some grapefruit bitters, which just gives a little bit of flavor without adding calories," Shelayna notes. "The same with gin and tonics with a little bit of basil lavender bitters — it brings out the botanicals in the gin." She mentions a few other easy substitutions: cherry bitters in place of sweet vermouth, rhubarb bitters for sweet and sour, and orange bitters for triple sec. The aromatics used in Skidmore Alchemy's products come from Lorien Herbs & Natural Foods in the South Perry District. Fruits are also sourced locally when available, from friends' and families' gardens and local farms. To make a batch of bitters, the couple uses a high-proof, neutral-grain spirit as a base that's then steeped for two to six weeks with a blend of all the herbs, spices and fruits needed to achieve a specific flavor. The solids are then strained out of the liquor and cooked down with any sweeteners (sugar or honey). After the cooked mash steeps by itself for several days, it's strained, and the resulting liquid is added back into the base spirit it was previously steeped in. Skidmore Alchemy initially began back in 2014, when Shelayna was bartending at Casper Fry, where she'd often make her own bitters blends to use in house cocktails. Around that time, the couple was tapped to help make a bitters infusion for Orlison Brewing's Old Fashioned beer, the 2 Finger Pour. That collaboration required the couple to set up standard business licensing, which led them to continue producing bitters as a small side venture. "We've been slowly growing since, and didn't think it was going to be something big, but people asked for more flavors," she says, adding that the eventual goal is to open a brick-and-mortar retail space with a bar. Tyson adds that their ultimate dream beyond that is to distill the spirits used in their products. 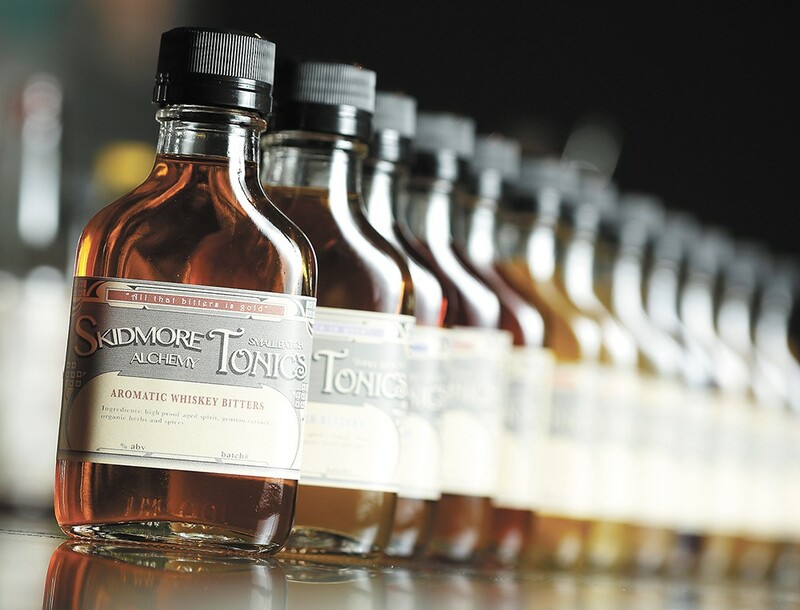 While cocktail lovers can find Skidmore Alchemy behind the bar at many local spots, including Remedy Kitchen and Tavern, Volstead Act, Durkin's, Lantern Tap House, El Que, Press Public House, Dry Fly Distilling's tasting room and many others — including both of the couple's places of employment — home bartenders can order the products online. Find Skidmore Alchemy's products online at skidmorealchemy.com.